They always say that you should never act with children or animals. 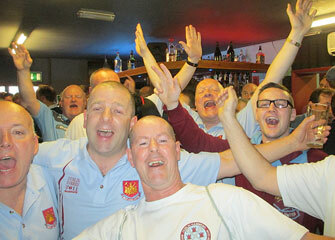 The same might be said for bringing teenagers on a Dublin Hammers trip!! President, Fran Ryan arrived at the airport with his son, Bobby and nephew, David. No problem you might say... except David has an identical twin brother with a passport that says “Andy” on it that David had on his person. So not good news when you’re flying Ryanair. Thankfully both David and Andy live in the same house near the airport so a few frantic phone calls later the right passport was on its way up to the airport. 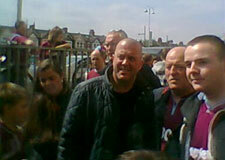 Allardyce signs new mature players. Yahoo... the pints are cheap!! As usual we all gathered in the airport bar and questions were asked of those dressed casually (no DH gear) if they hadn’t understood the discussion at the Everton game. It turns out most were confused. David (Andy) won the first Spot the Ball of the day at which point Liam announced that it was the custom to buy a round of drinks for all. Two minutes later and Liam won the Spot the Ball whereby the “custom” was quickly dispensed with. Never mind we sipped our refreshments and planned the days ahead. The Dublin Airport bar are feeling the pinch at the moment (we were about the only punters in it) so they kindly arranged with Ryanair to delay the flight, cue more queues – at the bar! President Ryan suffered the indignity of having his pint shrunk while Timmy Lloyd on hearing he was sharing the room that night with me (and my legendary snoring) opted for a whiskey!! Hurray, we’re all on the bus. Honey, they shrunk my pint!! Some of the O’Gradys line up. 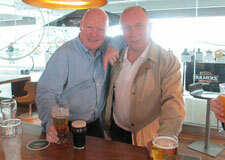 At last we were on our way and the usual banter was flying as we soared above the clouds on our way to Gatwick. When we landed, a few “sheep” took the wrong turn and were heading for the International Flights gates and had to be called back. Then it was into the Rep of Ireland queue for security etc. Some poor punter with a UK passport was turned back and told to go to one of the six free, no queue UK desks much to their displeasure. On our way to the coach park Josh played a blinder as he managed to get the 23 DH lads into the one lift. One or two other non DH people were going to get in but decided against it at the last minute for some reason!?! Outside the terminal and we get the luxury coach to take us to our hotel. Harry the bus driver tries to get the microphone working for Liam to tell us our itinerary for the weekend. In the end, Liam did his usual and roared. Who said it was Hawaiian night? 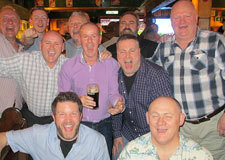 The Dublin & Hamburg Hammers Unite. Liam started off by reminding everyone that today was a marathon – not a sprint so to take it easy with the beer or they’d miss the fun later in O’Gradys. 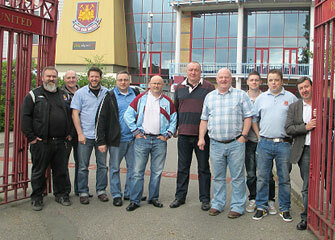 The options open for the afternoon were the trip to the shop and a few pints in the Boleyn Bar, the cultural tour or the Presidents Heritage tour. The President informed us that he would have a table set up in the hotel lobby area. 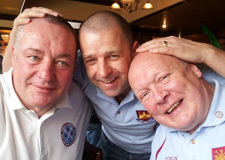 Liam also told us that for those interested (and still upright – remember it’s a marathon) we’d be off to O’Gradys that night and that the following day the meeting pub was M and Ms on the Barking Road. A lengthy debate followed on the dreadful football that is currently being served up and I have to say that I thoroughly agree – and the fact that the ticket cost £52 (yes you read it correctly) to watch a team hoof a ball up towards a big lad and hope for scraps makes me wonder on the direction of the club. As the President counted the show of hands it looked like most of the travelling party were in agreement. 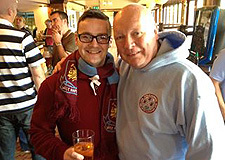 We all checked into the hotel and groups split with the majority opting for the club shop. The items on special offer ranged from XL to 4XL so I was snookered! As all the mirrors were removed from the shop for some reason I had to take a photo of the President to see if the top fit him. Anyway I bought a present or two and headed to the Boleyn for a few beers. 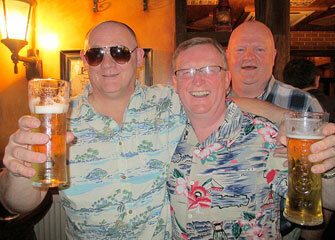 Belfast Hammers Dress Code Trip. Liam – The Spot the Ball King. Alan Carr... Chatty Man. Back to the hotel for dinner, showers etc and off to O’Gradys. The night started off quiet with the musician unable to accommodate President Ryan for Human – he didn’t know it! But the DJ came on and we were off. John Thompson was mistaken for John Travolta’s dad such were his moves, Adam the Chatty Man showed us that those years spent toiling in the Billy Barry School paid dividends with Gangnam style and other great moves, pints were drank, shots were downed (by the younger generation), Human was sang, Liam (I never win anything) won his second Spot the Ball, Martin headed off early saying he was sick of the place and only Brendan and myself wore our Hawaiian shirts!! We all got back to the hotel at various times and I believe that tales were told at breakfast in Weatherspoons next morning. President Ryan had to go to the hospital with Bobby who headbutted the bedside locker by mistake and ended up requiring stitches - we are led to believe that Marie (the First Lady) will be attending all future trips as the responsible adult! I brought David (Andy) for breakfast in Kens Cafe since he had “lost” his money the night before. It was off to M and Ms for a few before the game and there were plenty of laughs to be had. 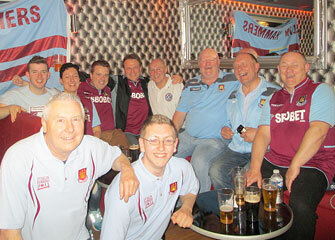 The Hamburg Hammers that we met the previous afternoon joined us and I don’t think they’ll ever be the same again. Alan Corr kept us informed of wallpaper prices and studied the murals on display in the pub while Martin proved to us that he hadn’t lost his haggis the night before. Post-breakfast drinks, Barking. Pre-match drinks at Barking Dog. Are we Human... or Dancers? 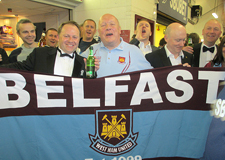 When we got to the ground we met up with the very well attired Belfast Hammers. 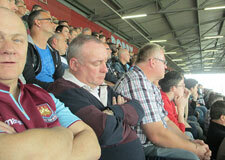 Brian turned up late for the game – he got mixed up and went to McArthur Park instead – and promptly fell asleep! The game itself was as expected – we hoof the ball up towards Carroll and look for anything. The Academy of Football my arse! It was a good thing we had seats in the Bobby Moore Upper as we could see more of the ball as it sailed through the air. 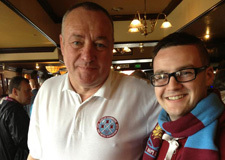 We were 2-0 up at halftime through Nolan and Vaz Te. We started the second half as if we had won the game and Reading scored 2 goals in two minutes and the crowd got angry. We stepped up a gear (ie we hoofed it longer!) and eventually got two more – the last goal a header from Nolan that Stevie Wonder could have scored so inept were the centre halves. Anyway a 4-2 victory and it was off for a swiftie before we get the bus. 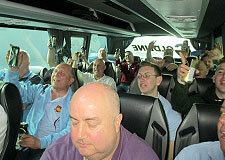 Yippee... there’s beer on the bus!! Another riveting WHU performance. Julian Dicks. The bus back to Gatwick is sometimes the best part of the trip. The jokes were flying, everybody was singing and snack boxes were wolfed. We all wondered if Martin ever stops talking... is he the new Gary??? Some fell asleep – how with the racket on the bus we’ll never know. 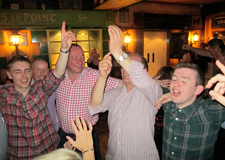 The drinks were flying and all agreed that Josh had put in a top notch performance with the arrangements. He will be sorely missed as our Travel Sec. We got back to the airport, dashed in, another swiftie in the bar and all were accounted for on the flight. We met the devastated Spurs fans (all five of them) and the sharp dressed and witted Chelski fan. 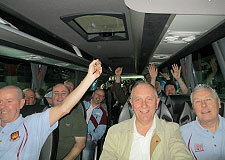 All in all a great trip that will live long in the folklore of the Dublin Hammers. Finally can I say that... Gary O’Neill was robbed!!!! See you all at the AGM. Thanks to Gerry Murtagh for the report and photos!